About one week ago the US-American animal advocacy group Mercy for Animals – popular with vegan Hollywood celebrities and pop musicians like Moby – published a one-minute video titled “Can Babies Be Vegan?”. FIRST POSSIBILITY: The organization doesn’t know that this information is wrong. One might call this “ignorance”. SECOND POSSIBILITY: The organization knows that this information is wrong but they pretend that it is correct. Anyone would call this “lying”, right? 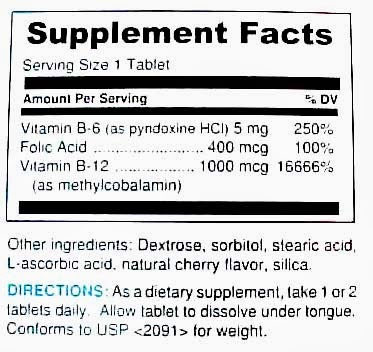 B-12-containing supplements – or they could become deficient, as shown in case studies of vegan infants, children, and adults. intakes and the adverse effects of iron deficiency, a low-dose (30 mg) iron supplement is recommended in pregnancy. The recommended amount of iron could be provided via a prenatal supplement, a separate iron supplement, or a combination of these. There is insufficient evidence that zinc intake and status in vegetarian pregnancies differ from nonvegetarian pregnancies. Due to the increased zinc requirements of pregnancy and the lower bioavailability in diets based on high-phytate grains and legumes, increasing zinc intake and using food preparation techniques that improve bioavailability are recommended. Pregnant and lactating vegetarians need regular and adequate dietary and/or supplemental sources of vitamin B-12. Infants of vegetarian women have lower plasma DHA concentrations and breast milk of vegetarians is lower in DHA. These n-3 fatty acids can be synthesized to some extent from a-linolenic acid, but conversion rates are low (though somewhat enhanced in pregnancy). Pregnant and lactating vegetarians may benefit from direct sources of EPA and DHA derived from microalgae. Exclusive breastfeeding is recommended for the first 6 months. If breastfeeding is not possible, commercial infant formula should be used as the primary beverage for the first year. Complementary foods [foods after weaning] should be rich in energy, protein, iron, and zinc, and may include hummus, tofu, well-cooked legumes, and mashed avocado. 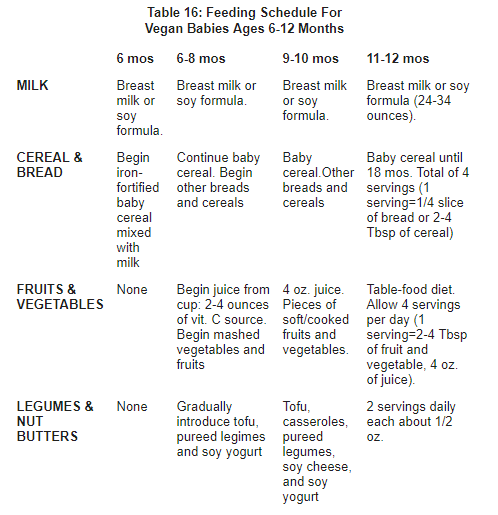 Full fat, fortified soy milk, or dairy milk can be started as early as 1 year of age for toddlers who are growing normally and eating a variety of foods. Vegetarian children and teens are at lower risk than their nonvegetarian peers for overweight and obesity. COMMENT: The first foods might typically be vegan but very soon afterwards – typically – meat and fish and possibly eggs are given to the baby. Meat and fish provide protein, iron, zinc, and most importantly vitamin B12. Sea fish also provides iodine. It is very important that extra care is taken that vegan babies receive enough vitamin B12 and iodine. The Academy of Nutrition and Dietetics (AND) recommends a diet including meat and fish as their standard recommendation, including “Cooked and pureed meat or poultry” at 6 months of age and including “Well-cooked, minced or finely chopped meat, poultry or fish” at 9 months of age. 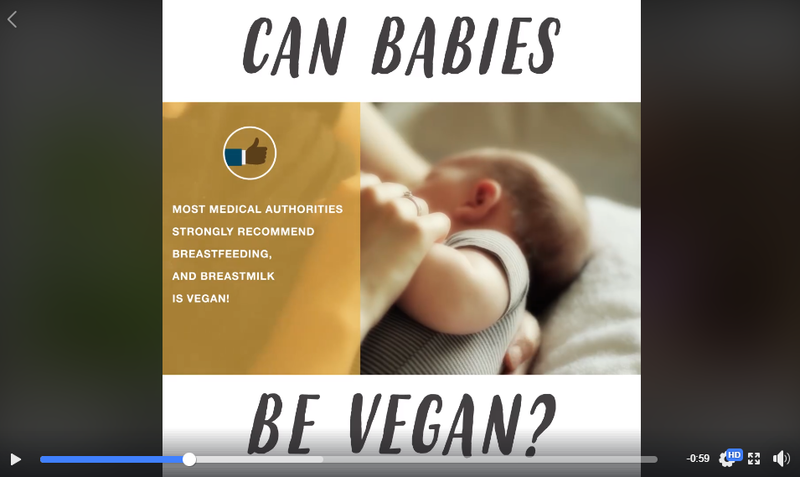 Both the AAP and the AND accept well-planned vegan diets for babies though – unlike the most recent document on “weaning foods” (complementary foods) by the World Health Organization (WHO) which is from 2003 and which rejects vegetarian diets for babies. Luckily, no one reads these really long WHO PDFs – except for big decision makers who advice governments and large medical organizations globally. I sincerely hope that the next time the WHO publishes a document on complementary feeding it will include the statement that well-planned and adequately supplemented vegan diets are safe and possibly beneficial for babies. 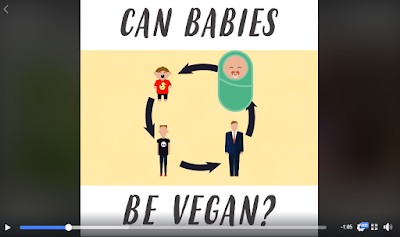 But if large vegan organizations keep contributing to vegan babies suffering from vitamin B12 or iodine deficiencies then that is unlikely to happen. COMMENT: This is misleading and dangerous. Vegan babies, or any other vegan, cannot get enough vitamin B12 (or iodine) from beans, grains, fruits or vegetables. Iodine could be obtained from sea vegetables but due to the potentially very high iodine content (toxic) I would not recommend sea vegetables for vegan babies at all. COMMENT: The evidence for this is extremely weak (also see here). COMMENT: This could be true. COMMENT: Yes, exactly! 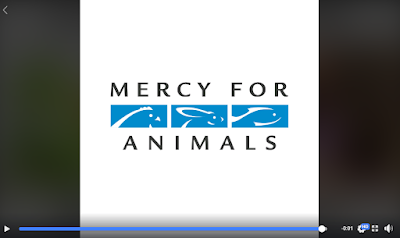 Don’t vegan kids deserve not suffering brain damage caused by vitamin B12 (example 1 from Italy, example 2 from Turkey) or iodine deficiency (see here and here for two cases of vegan babies with iodine deficiency, and here for the connection between iodine deficiency and brain damage)? I am convinced that well-planned, adequately fortified vegan diets are excellent for babies and everyone else. I am also convinced that there have been more than enough cases of severely and mildly vitamin B12 deficient, vitamin D deficient and iodine deficient vegan babies. We know that the first two (B12 and iodine deficiency) can be very dangerous and lead to severe and irreversible brain damage. Vitamin B12 deficiency during pregnancy or in babies can also result in stillbirths and death. 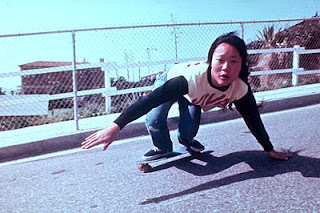 I am also convinced that all vegan children have a moral right to adequate nutrition, and that leaders of vegan organizations who cannot see this should resign today. Half-truths about vegan diets for babies can seriously harm vegan babies – please do listen. For a great guide on feeding vegan kids read the article Feeding Vegan Kids by Reed Mangels.